Last fall, the Illinois legislature passed a school funding bill, SB1947/PA 100-465. (The Invest in Kids Act). As part of this legislation, a tax-credit-scholarship program for students to use for tuition at a private school was established. Individuals and corporations can donate to a scholarship fund, and receive a hefty tax credit of 75% of their donation, up to $1 million reduction in taxes annually for an individual donor. Corporations and individual donor have the power to earmark where there tax dollars are going, an undemocratic process. Tax credit scholarship programs divert public funds to private schools. $100 million has been allocated for this program; that means $75 million less for public schools. Money goes through a Scholarship Granting Organization which then directs the funds to non-public schools who distribute this tax credit "donation" to eligible students. The Illinois constitution includes a Blaine Amendment which prohibits any appropriation from public funds to aid any church purpose. Since tax credit scholarships don't explicitly use public funds as tuition, they don't face the same legal challenges as voucher programs. The largest SGO is Empower Illinois, which controls $33 million in taxpayer contributions. According to WBEZ, that is 74% of all scholarship donations pledged statement. 5% of all contributions can be kept for expenses. The biggest player in Empower Illinois is the Catholic Church; 77% of all donors statement have chosen Empower Illinois to receive their donations. The Big Shoulders Fund that has over $8 million in taxpayer dollars pledged is also affiliated with the Catholic Church. Tax credit/scholarships programs are a stealth voucher program - an attempt to privatize our public schools led by Betsy DeVos and Trump. Legislation introduced by State Senator Bertino-Tarrant provides that if public schools aren’t fully funded that the tax credits authorized by PA 100-465 would be prohibited from being granted. SB2236 requires the Illinois State Board of Education to determine whether or not the State has met the minimum funding level for the fiscal year. If there is not enough money for public schools, then no tax credits can be used by corporations or individuals contributing to scholarships. They could of course continue contributing to the private school fund, but will not benefit financially from their contributions. Students receiving scholarship funds for the 2018-19 school year will continue to receive the available funds. 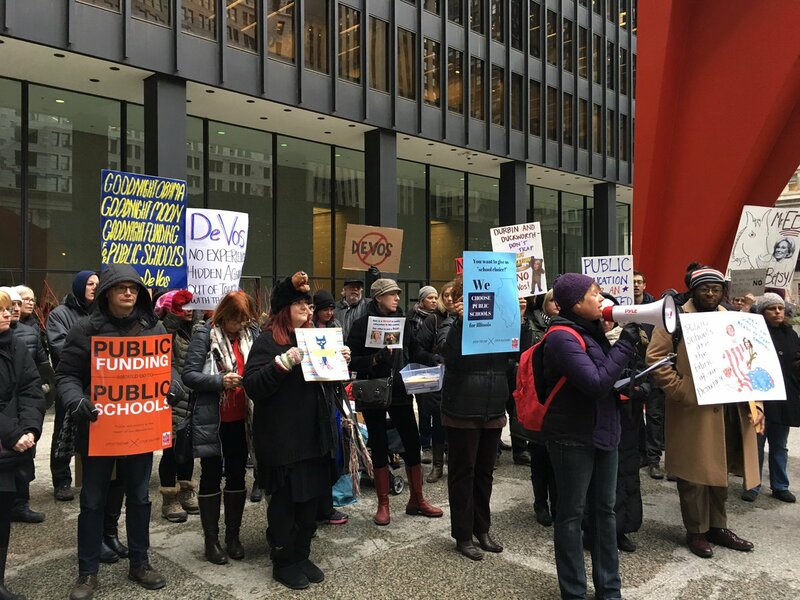 The IL General Assembly is back in session this week, and there's an important bill on the agenda in the Senate Education Committee this Tuesday, Jan. 30th for supporters of public schools and the common good.